Hello and welcome to my Indie Author site - Feel free to contact with details of your book, or add a review. If you want to recommend an Indie Author site or link, get in touch. Debut Novel - Book one in the Celtic Connection - a great read for only 0.99 cents! “But the treasure is guarded by Excalibur. He who wishes to enter the secret chamber must first ensure he knows of the Celtic rites. Another may enter, provided he is accompanied by one who has been initiated into the mysteries. No other hand is permitted to touch Excalibur, sacred sword of the Celtic nations.” … from the diary of Joan, Princess of Wales. Joan’s diary: Truth – or medieval fable? Except her father was King John, last scion of the powerful Plantagent dynasty. John the unlucky who lost everything fleeing across the mud flats of the River Wash, just as the tide turned. The Crown jewels, priceless religious artefacts, even it was rumoured the mythical Excalibur. Rhyllann (Rye-lann) Jones is an ordinary fourteen year old with ambitions. He wants to be the coolest kid in school, date Becky Roberts, designer clothes, the latest smart phone; the usual stuff. But he has a gift. An amazing gift which gives hope to a secret ambition, one so fantastic he hides it from everyone. Llyrwynn (Lerr-wen) is the only person who knows what drives Rhyllann. But then Llyrwynn’s the geek who knows everything. And now he thinks he knows where a medieval treasure is buried. And he wants Rhyllann to help find it. Together the cousins race against a quasi-religious cult who will stop at nothing in their quest to find Excalibur. DI Crombie of the Met Police is also on their trail. He knows something Rhyllann refuses to believe. Llyrwynn is a master manipulator; he makes Machiavelli look like a boy scout. 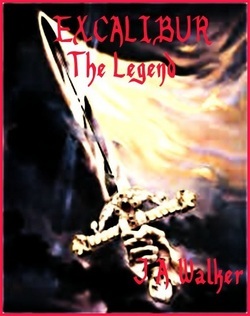 REVIEWS FOR THIS BOOK CAN BE FOUND ON AMAZON.COM & AMAZON.CO.UK Sample downloads available! PRESS RELEASE: Get this book half price! Download from Smashwords & enter code UL52H Click here now!